Goalkeeper Willy Caballero joined Chelsea FC in 2017 and wears the number 1 shirt. The Argentine goalkeeper joined the Blues on a free transfer on 1 July after departing his former club Manchester City. Caballero started his career in 2001, playing for Boca Juniors. He won three major titles with Boca, including being in the Boca squad that beat AC Milan in the Intercontinental Cup in 2003. Caballero made the move to Europe in 2004, joining Elche who were playing in the Spanish Second Division at the time. Caballero would feature 195 for Elche as their number-one goalkeeper. His stellar play for Elche attracted the attention of Malaga, and in 2011, Caballero joined Malaga in a €900,000 emergency transfer after an injury to Sergio Asensio. He went on to feature 133 times for Malaga and holds the club record for the longest period time without conceding a goal after not allowing a goal for 480 minutes. Caballero’s former manager at Malaga, Manuel Pellegrini, brought the goalkeeper to Manchester City in 2014. Under Pellegrini, Cabellero was the backup to goalkeeper Joe Hart before replacing Hart as City’s number one in 2015 under Pep Guardiola. Caballero would again become City’s backup keeper when Claudio Bravo joined City in 2016, but would regain the starting job after a string of poor performances from Bravo during the season. Caballero opted not to renew his contract with City and after turning down offers from Newcastle and Brighton and Hove Albion, he joined Chelsea after the departure of Asmir Begovic. Defender Antonio Rudiger became a member of the Chelsea FC squad on 9 July 2017. The German defender can play both right back and centre back and started his professional career at VfB Stuttgart. He made 80 appearances for the German side, mostly at right back, despite being plagued by injury issues early in his career. Despite those injuries, Rudiger was linked with a move to London at the start of the 2015 season when then-manager Jose Mourinho was looking to strengthen his defence. Rudiger, however, opted to join Roma on loan, and was able to establish himself as a regular under Luciano Spalletti. Roma made his loan stay a permanent on at the start of the 2016 season for a €9 million fee. Rudiger is also a regular in the German national side, making his first appearance in 2014 during qualification for Euro 2016. Rudiger would miss the Euro 2016, however, after suffering a cruciate ligament tear prior to the start of the tournament. Rudiger did feature this summer for Germany in the 2017 Confederation Cup and joined the Blues at the conclusion of the tournament. Marcos Alonso is a defender who joined Chelsea FC in 2016. 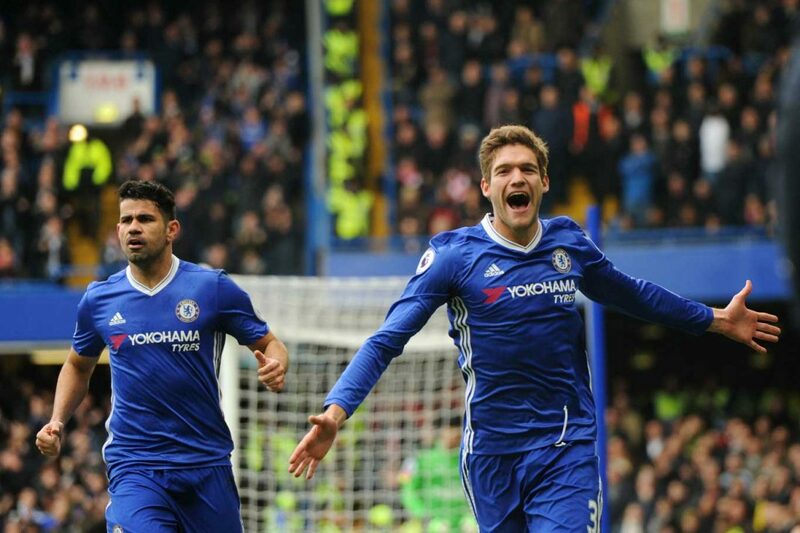 Alonso started his career in Real Madrid’s youth academy, following in the footsteps of his grandfather Marcos Alonso Imaz and his father Marcos Alonso Pena. Alonso made his reserve team debut in 2008, joining the first team a year later in 2009 under then-manager Manuel Pellegrini. Alonso’s official debut for Real Madrid came in 2010. Alonso joined Bolton Wanderers in summer of 2010 and featured 46 times over three seasons for the club. Alonso joined Italian side Fiorentina in 2013, and after making just 9 starts in first season in Serie A, he would return to England in January, playing for Sunderland under manager Gus Poyet. Alonso made 20 appearances for the Wearside club in the second half of the 2013-2014 season. Alonso would return to Italy to start the 2014-2015 season and would establish himself as left wing back for Fiorentina, making 76 appearances in all competitions over the next three seasons before joining Chelsea for the 2016-2017 season. Alonso made 35 appearances in all competitions for the Blues in their title-winning campaign in his debut season.